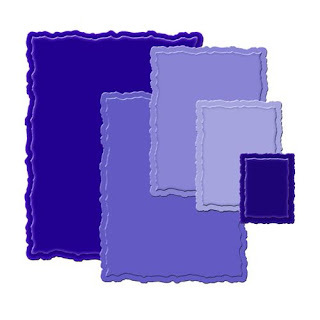 This large set of Deckled Rectangles will be great to use with the small set to make a border, etc. Approximate Die Template Sizes: 1) ⅞x1⅛" 2) 1⅜x1¾" 3) 1⅞x2⅜" 4) 2⅜x3⅛" 5) 2⅞x3¾"
$21.95 plus shipping. Please e-mail me if you would like to puchase this set. I accept Visa, Master Card and PayPal.